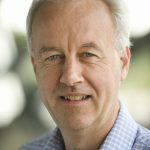 Professor Gordon Dougan, Ph.D., – Professor Dougan is a group leader at The Wellcome Trust Sanger Institute (WTSI) and a Professor in the Department of Medicine at Cambridge University. He also holds adjunct professorships at the Universities of Monash and Melbourne. His personal research team studies enteric pathogens with a strong emphasis on pathogenic mechanisms, genomics and immunology. He has a particular interest in using genomics to study the evolution of Salmonella enterica serovar Typhi, the cause of typhoid. Before moving to the WTSI he was the founding Director of the Centre for Molecular Microbiology and Infection at Imperial College London and a Professor of Biochemistry. He is a member of EMBO and a Fellow of the Royal Society. He received his B Sc and Ph.D. from the University of Sussex and conducted postdoctoral studies at the University of Washington (Seattle) in the laboratory of Stanley Falkow. He worked in industry developing novel vaccines at an internationally renowned multi-national company and is an expert in vaccinology.